Before I moved to Long Island, I thought black people had the market on mac ‘n cheese. Very soon, I discovered that for sheezy my cheesy is, in fact, the craze of almost every Euro-American restaurant in the state of New York. Even the fancy “organic” pub in my town has mac ‘n cheese on the menu. And not as a side dish or an appetizer — they serve it as an entree. Anyway, this weekend I found myself craving something rich and decadent, so I gave vegan, gluten-free mac ‘n cheese the old college try. This ahhhhmazing dish turned out to be a spicy, robust, savory and delicious – just the way I like it. Cook elbows according to box instructions. Drain the elbows, rinse with cold water. 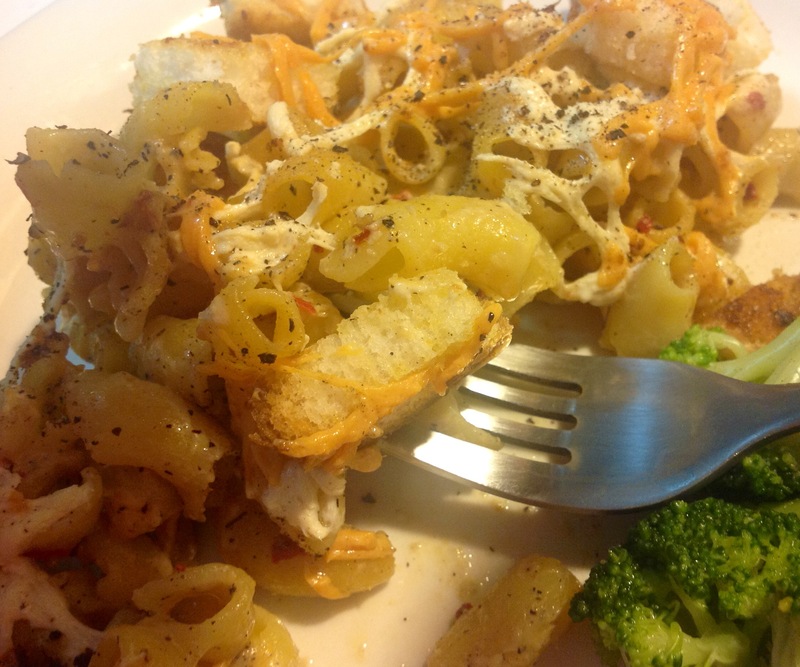 Sprinkle the macaroni with sea salt (not too much!) and black pepper. Transfer elbows back to the pot and pour in the roux. Stir and taste. If it’s not robust and cheesy enough, add more nutritional yeast and/or Daiya cheese. When the taste is better-than-your-momma’s mac ‘n cheese, pour the mix into your baking dish. Set the baking dish aside and prepare the croutons. In a small saucepan, heat 2 tablespoons of olive oil. Slice the bread into little squares and transfer to the pan. Turn frequently until lightly toasted on both sides and sprinkle with nutritional yeast, salt and pepper. 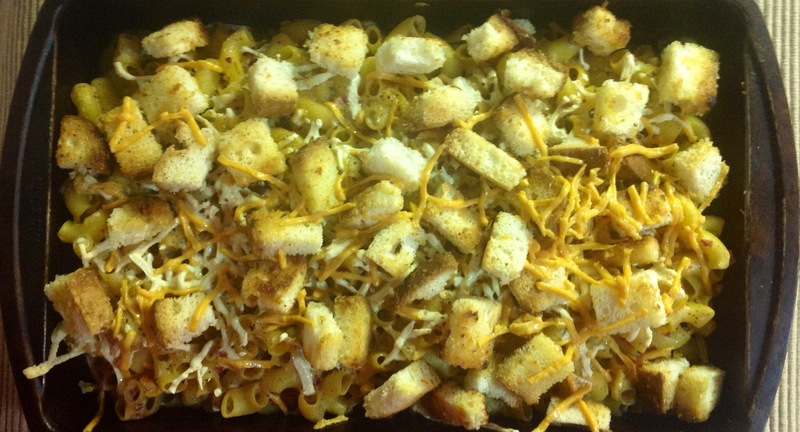 Sprinkle the croutons over the elbows and throw in some more cheese. Bake for about 30 minutes (but monitor closely). To get a nice bubbly finish, broil for 3-4 minutes. It was fabulous. So good, in fact, that I had a bite for a midnight snack..
Clearly you make eating good healthy food look so easy, yummy and anything but boring! I’ll have a hibiscus ginger carrot juice toast to that! Cheers! 🙂 It’s gluten free and vegan.. I’m not counting carbs, cal or fat .. I suspect that it is much “lighter” than the southern version if only because there is no butter.